Sports Basement has a new awesome community page called the Basement Buzz. 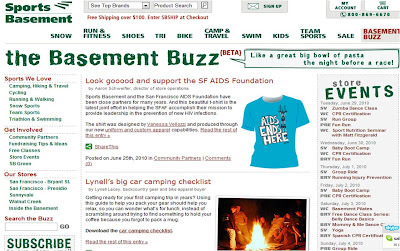 If you're like me and live in San Francisco, you probably buy all your sporting goods from Sports Basement. There is something wonderful about the tone of the store. You feel like you are finding little gems all over the store, yet it's a big box store so everything you could ever want is there. And of course, you can't beat the scenery at their Presidio store. It's an anchor for everyone active along Chrissy Field. My favorite part of the Basement Buzz is the Store Events Calendar. Sports Basement has a bunch of cool promotions and speakers. Seeing the schedule is really helpful for catching these events. Sports Basement is one of my favorite stores, and even if you don't live in SF, you should check it out because they ship across the country and a lot of their content is still applicable to you.